Step 1 In a large bowl, combine the stuffing ingredients of rice, ground beef, shredded onion, fresh parsley, dill, diced tomatoes, water, olive oil, allspice, garlic powder, and salt and pepper. Mix by hand to combine. Step 2 Now, remove the top of 3 tomatoes and remove the core to hollow out the tomatoes making room for the stuffing. Do this using a corer like this one. Step 3 With a knife, remove the very top of the zucchini, then cut each zucchini in half to make shorter zucchini for stuffing. Now you need to hollow out the zucchini to make room for the stuffing. Step 4 Insert your corer about 3/4 of the way into the zucchini, making sure not to poke the bottoms. Twist the corer and pull out the zucchini cores or hearts. Do this a few times, and gently scrape the sides of the zucchini until you have hollowed each out making room for the stuffing. You’ll want to leave about 1/4 inch rim of zucchini. Step 5 Lightly oil the bottom of a large deep cooking pan like this one. Slice the remaining tomato and spread over the bottom of the pan. Now add the onion slices and the cores or hearts of the zucchini. Sprinkle with a little salt and pepper. Step 6 Now, using your hands, gently stuff the hollowed tomatoes with the rice stuffing. Then loosely stuff the zucchini with the rice stuffing about 3/4 of the way (do not over-stuff or crowd the rice stuffing in the zucchini or it will not cook well). Step 7 Arrange the stuffed tomatoes in the center of the cooking pan, then add the stuffed zucchini (stuffed side up) around them. Tilt the zucchini a little, this helps them cook nicely through using less liquid. Step 8 Now add the tomato sauce and water. Sprinkle lightly with salt and pepper. Step 9 Place the pan on the stove and cook on medium-high heat until the liquid starts boiling. Turn the heat down, cover and simmer for for 50 minutes until the zucchini is tender and the rice stuffing is fully cooked. Step 10 Transfer to a serving platter or individual bowls. Top with the sauce from the cooking pan. Enjoy! 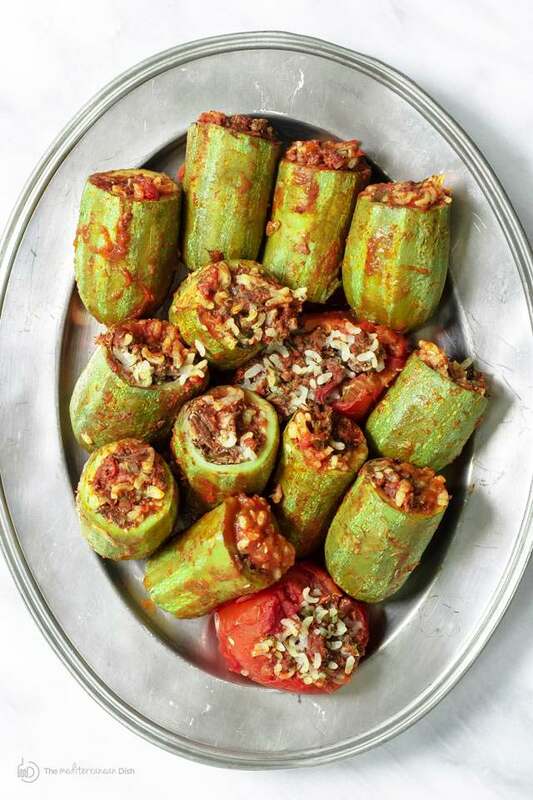 Stuffed zucchini, Middle Eastern style! In this recipe, the humble zucchini act as vessels for a special stuffing of spiced rice and ground beef with tomatoes and fresh herbs. See my step-by-step tutorial for foolproof, and absolutely delicious results!